I have created a new spfx webpart from yomen generator. and deployed to sharepoint. It is working in the classic sites and workbench page. But in the modern site, modern page. it is not showing web part properties in the webpart properties pane. 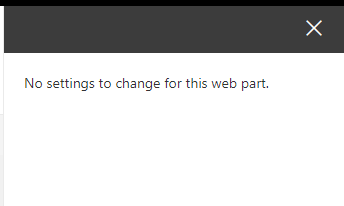 its showing error saying No settings to change for this web part.. This is simple spfx webpart without any customization directly deployed newly created webpart and testing. Please help with this ASAP. I am not sure what was the actual issue. I uninstalled the Gulp, yo, Microsoft SharePoint generator. and installed again. and generated a new application which started working. Earlier my SPFX version was 1.7.0 now it is 1.7.1. Hoping that there was some issue with the SPFX package version or other packages related to this application. Not the answer you're looking for? Browse other questions tagged sharepoint-online spfx modern-pages modern-team-site or ask your own question.